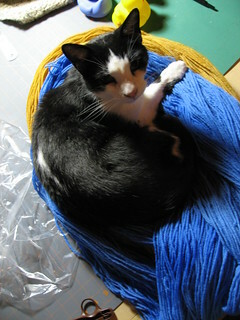 I kettled dyed some yarn a couple of days ago and while I was at work this is what our Basil Boy kitty was up to. 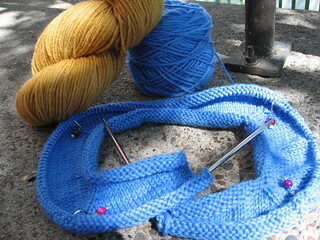 The colors are a yummy Toffee and Bright Blue. This wool is for Andrews Hoodie Cardigan called Émilien . A little about myself…I enjoy spinning fiber, knitting, gardening, wine making, and of course playing xbox360 and computer games. I am married to a wonderful Northern Englishman , Andrew (KnitFingers). We have 5 cats , Saffy the albino, Basil the tuxedo, Tigerlily the tabby, Moon the siamese, and the lovely but naughty milk face, Violet. I hand-dye yarns that I sell on Etsy… icandyarn. Every once in a great while I sell my Handspun Sock Yarn.